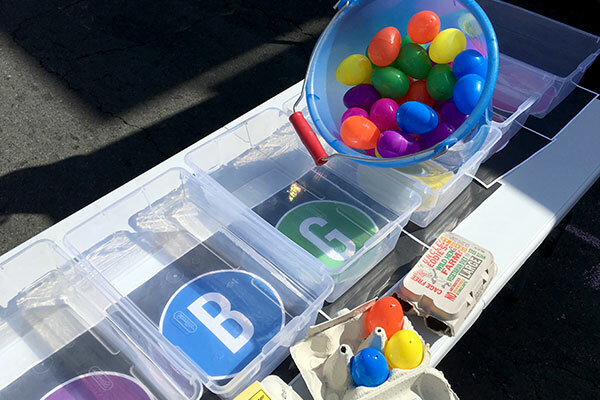 In Mini Bus Madness, players cooperate to operate a simulated bus system: pick up passengers in your egg carton bus and drop them off at their destinations, while avoiding overloading and bunching along the way. There are two versions of the game (see rules below): a fast-paced color-sorting game for younger players, and a slower (but more chaotic) simulation mode for more strategic players. Mini Bus Madness was designed for Transit Week 2017; thanks to SF Transit Riders for inspiration and help. To drop off as many passengers as possible at their stops in 1 minute. Draw a passenger from the bucket and place it in the first stop. If the drawn passenger matches the stop color, put it back in the bucket and redraw. Move to the next stop and repeat. Keep moving up and down the line, placing passengers as quickly as possible until either the timer is up or you run out of passengers. If there are multiple drivers and they are playing the difficult version: do one run up and down the line (so there are 2 passengers at each stop) before starting. Grab a passenger and put it in your bus! Take the passenger out of your bus and put it in the stop that matches its color! Pick up a passenger from the first stop and place it in the bus. If the stop's color matches the passenger, remove the passenger from the bus and drop it off. Pick up any off-color passengers at the stop. Move up and down the line, dropping off and picking up passengers. If your bus is full, you cannot pick up a passenger until you have dropped off a passenger to make room. Move to the next stop. Each driver starts at the first stop after the previous driver has left it. There can be multiple drivers at a single stop. Drivers cannot pass each other.